As some of you may have known, I'm currently studying for the second year of my Master's degree in Shanghai, China at Fudan University. Last week, I had the great opportunity of visiting the newest Disney theme park that just opened a couple of months ago, Shanghai Disneyland. 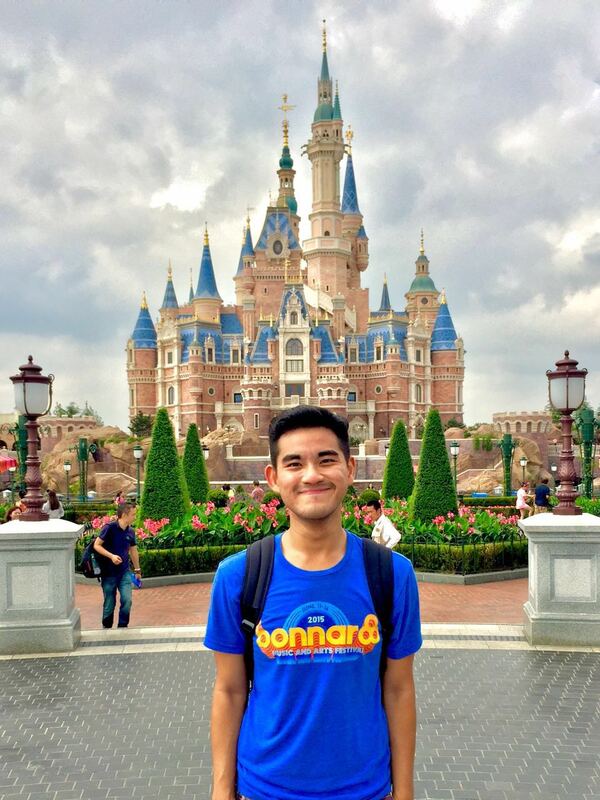 My visit to Shanghai Disneyland marks the second time of me visiting all Disney theme parks around the world. In this entry, I'll give you my initial thoughts on this Disney theme park. I know a lot of you might have some questions about the park, ranging from the Pirates of the Caribbean ride and the TRON roller coaster, to the behaviour of the local visitors. At the very end of this entry, I'll also give you some IMPORTANT TIPS to make the most of your day at the park. In case you don't know, Shanghai Disneyland is MASSIVE! It's true what they said about this being the largest Disney Magic-Kingdom-style theme park. I also like the fact that - despite being opened just a couple of months ago - the park has a lot of attractions. 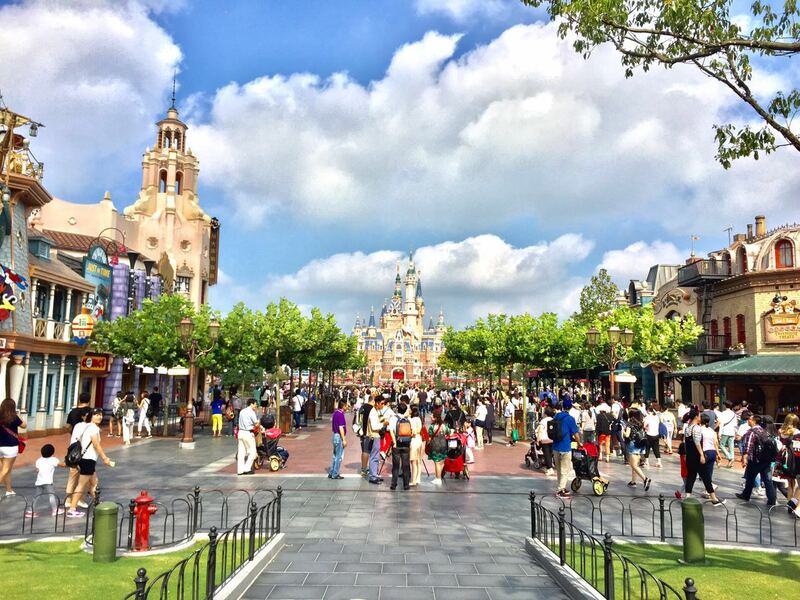 In contrast to Hong Kong Disneyland right after it opened, Shanghai Disneyland feels more "complete." I didn't feel that Disney rushed the park's opening this time around. The trees looked grown and taken care of enough. 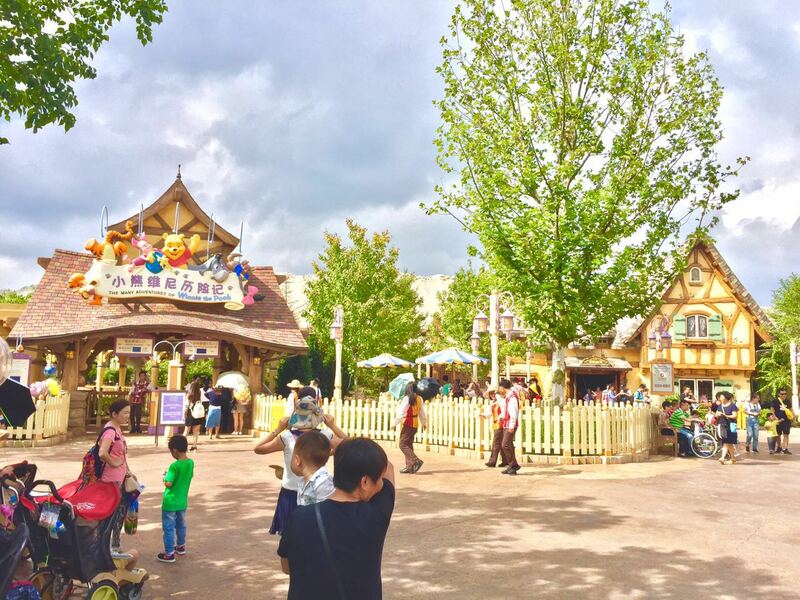 The park layout is well-thought, and the staffs are generally well-trained. Instead of the typical Main Street section, the entrance area of Shanghai Disneyland is replaced with an area called Mickey Avenue. One thing that is noticeably different from other Magic Kingdom parks is the absence of Main Street area. In its place is Mickey Avenue, a small entrance area with cartoonish-looking shops and a much shorter main path in the middle. It's good that this makes the entrance area feels more open. Nevertheless, I felt "less welcomed" as I entered the park. The area right in front of the Enchanted Storybook Castle is exclusive to Shanghai Disneyland, named Gardens of Imagination. The carousel and the Dumbo rides are located within this area. This area provides a lot of space for visitors to watch the firework, which is a good thing. Unfortunately, this creates "emptiness" in the dead middle of the park, which took some time for me to get used to. Other than these two areas, the park has four additional major areas where most of the attractions are located in: Adventure Isle, Treasure Cove, Fantasyland, and Tomorrowland. 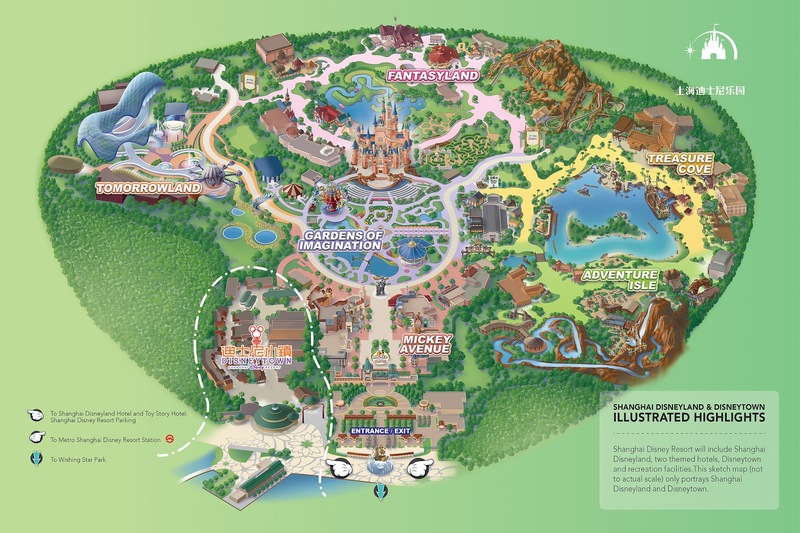 A not-to-scale park map of Shanghai Disneyland, showcasing all areas. Disneytown is included in the map. Okay, looks like we're all oriented with the park. Let's dive right into the park itself, shall we? Adventure Isle instead of Adventureland? Located at the right-hand side of the park, this area houses two star attractions of the park: Roaring Rapids and Soaring Over the Horizon. Due to their family-friendly nature, approximately 80% of guests flock this area as soon as the park opens, resulting in excessively long waiting time for both rides. Fastpass tickets for these two rides also run out very quickly every day, so make sure you get them as soon as possible if you wish to. NOTE: Click the subheadings for POV videos of the rides! Soaring Over the Horizon's dramatic entrance, right next to the Roaring Mountain. Let's talk about Soaring Over the Horizon. If you've been on its sister rides at Disney's California Adventure and EPCOT, then you're not missing out a lot. However, the storyline on this ride is entirely different: instead of boarding a flight around the world, guests are taking a magical flight thanks to the tribal sorcery that allows them to fly like a thunderbird. Unlike its sister rides, Soaring Over the Horizon is themed to a tribal adventure in which guests are taken on a magical flight on a thunderbird. As expected, Soaring Over the Horizon doesn't disappoint. Around 90 people are taken on a "flight" at one time. As the lights go off, riders are lifted up into a massive, parabolic screen that gives them 180-degree perspective of the flying experience. One second, guests are in Switzerland and the other they're in Fiji. The Chinese visitors, especially, seem to love this ride a lot. They cheered and clapped a lot throughout the entire ride. Guests are transformed into thunderbirds, allowing them to freely fly around the world. I must admit that the new version lacks the emotional connection that the old version had, both visually and musically. Thankfully, I didn't find the transition from one scene to another as distracting as others thought. In fact, I think it's wonderful that this attraction now flies around the world instead of just California. Overall, a great ride that is wonderfully appreciated by the local visitors. 8/10. Occupying the centrepiece of Adventure Isle - the Roaring Mountain - is the whitewater raft ride called Roaring Rapids, a water-based attraction that was created in place of the usual Splash Mountain. Roaring Mountain lights up at night, giving itself an eerie but enchanting look. The ride has a layout similar to Grizzly River Run: you go up a massive hill, go around the centrepiece with a small drop in the middle, and then ends up with a main drop at the end of the ride. Roaring Rapids' climax, on the other hand, is in the exact middle of the ride, where riders encounter a monster named Q'aráq, a giant-sized crocodile monster in the form of a rather impressive animatronic. 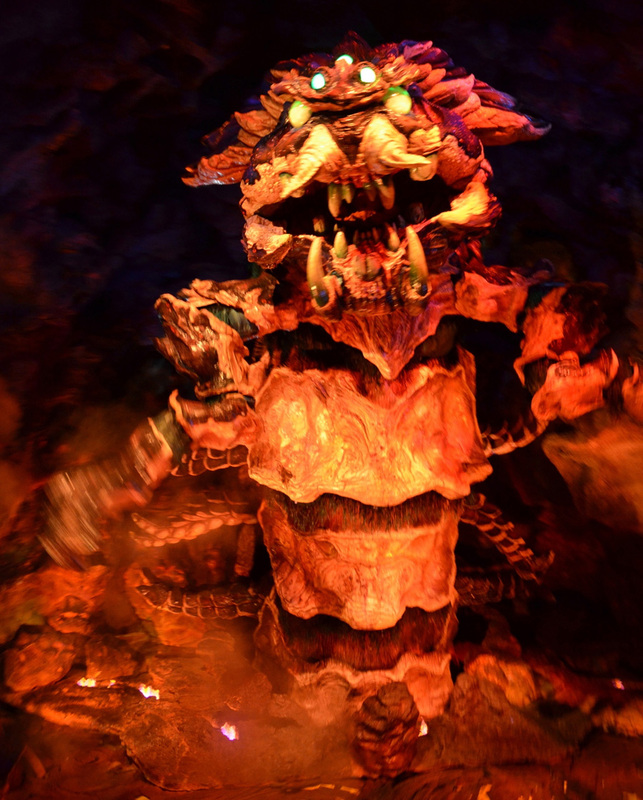 While it's not as advanced and terrifying as the lava monster at Tokyo DisneySea, it's still one of the best animatronics Disney ever made for its sheer size. Unfortunately, riders get a glimpse of this magnificent work for only a couple of seconds. The area of Roaring Rapids is covered with heavy mist. Roaring Rapids, however, isn't as wet as you might wish it to be. When I rode it, I left with just a couple of droplets on my shirt and that was it. Rather disappointing, to be honest, with the exception of the animatronics. Ride this only if you want to cool off when it's hot, or if you want to encounter Q'aráq. 7/10. Treasure Cove is an entirely new area exclusive to Shanghai Disneyland. 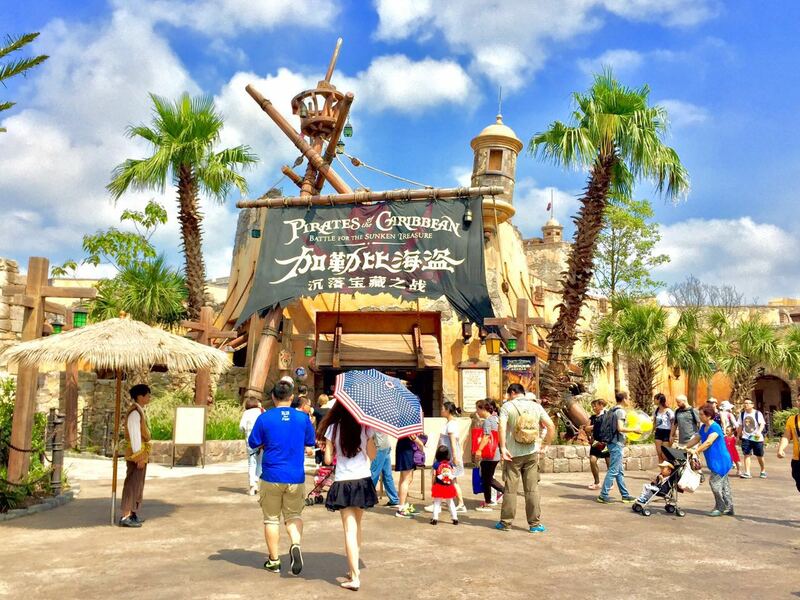 Based on the super popular Pirates of the Caribbean movie franchise, it's not surprising that the reason people come to this area is solely on one - and only one - attraction: Pirates of the Caribbean. 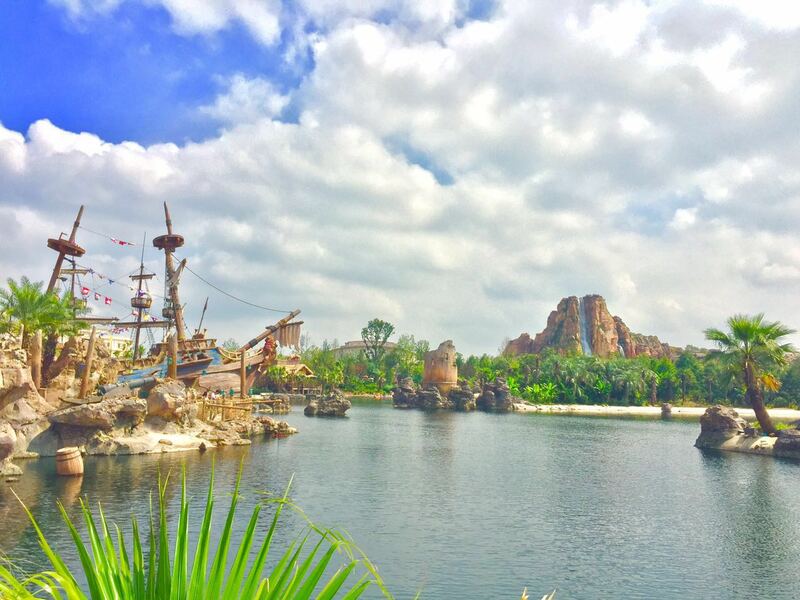 The lake surrounding the Treasure Cove and Adventure Isle provides photogenic view. The Roaring Mountain can be seen across the lake. The Shanghai Disneyland version of this ride is based on the movie franchise instead of the original version and, as such, the storyline is completely different. Those who had been on this ride before I visited the park often called this particular ride the best Disney ride ever created. Being the usual skeptical and pessimistic me, I thought they over-exaggerated. I found the other Pirates of the Caribbean rides to be good, but not great, and more towards "classic" rather than spectacular. Boy, oh boy... they were right. This is, without doubt, the BEST WALT DISNEY THEME PARK RIDE EVER! 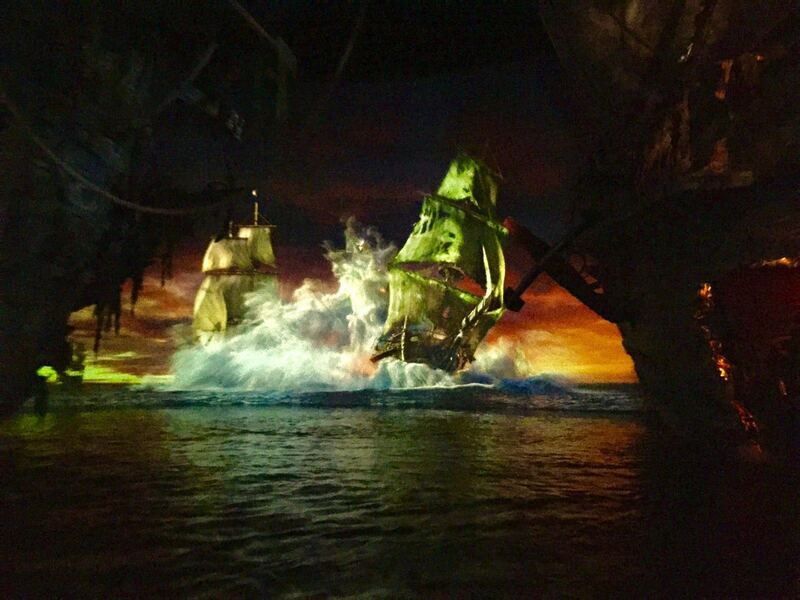 Pirates of the Caribbean: Battle for the Sunken Treasure is - in my opinion - the best Disney ride ever built. If I can take a guess on why Disney built this ride, it's perhaps because Disney knows it got hurt real bad by the Wizarding World of Harry Potter at Universal Orlando. So what did they do? They came, they observed, they recreated the Harry Potter rides concept, add some Disney magic, and... BOOM! This ride was born. I've never seen technology anything like this in a theme park attraction before. Disney fuses screens and visual effects seamlessly with the massive set design and special, physical effects. Not to mention, the screens in this ride are Ultra High Definition and HUMONGOUS. Rather than using parabolic screens that you might find on The Forbidden Journey, Disney uses a much simpler curved screen, but compensate it with ultra wide projection. The climax of the ride takes guests into the middle of the action. The loading and loading station of Pirates of the Caribbean. The ride has a very high capacity, resulting in - often - short waiting time. One more impressive feature of this ride is the boats themselves. Unlike typical ride of its kind, the boats on Pirates of the Caribbean can manoeuvre themselves in all direction. Throughout the course, the boats move forward, backward, sideways, and even rotate in place. In addition, the boats can accelerate and slow down according to the scene sets. If there is only one ride that Disney can be proud of right now, it would be this one. Definitely a must-ride attraction of the park. 10/10. 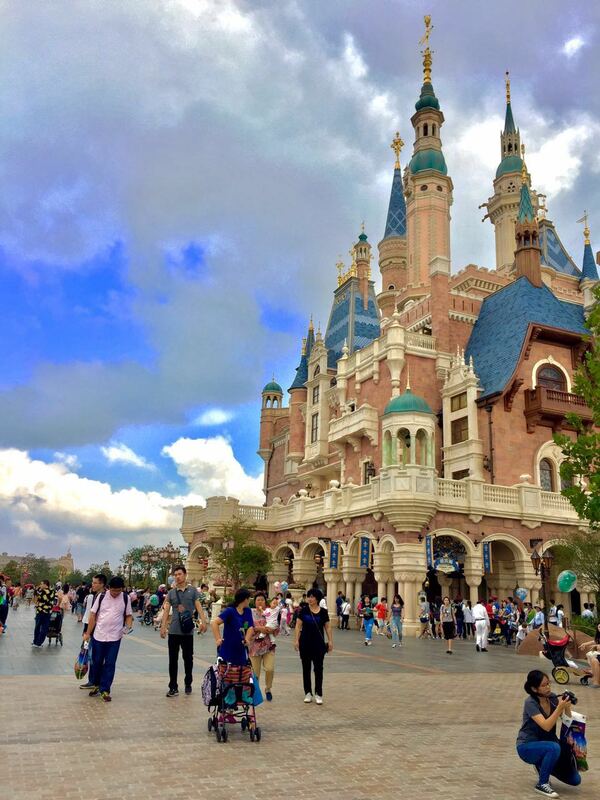 Fantasyland is the largest themed area at Shanghai Disneyland, and also has the most attractions. Given its proximity to the Enchanted Storybook Castle, it's no question that this is an area where guests often take their photos too. The Enchanted Storybook Castle right before the sun set. The most popular ride in Fantasyland is the Seven Dwarfs Mine Train, a family roller coaster that takes the riders into the world of Snow White. In this roller coaster, guests help the seven dwarves do their mine duties as their train - the mine carts - sway from side to side. Great fun for all ages. 7/10. The Seven Dwarfs Mine Train's first hill following the loading station. The Many Adventures of Winnie the Pooh had a waiting time of 65 minutes, so I decided to skip it. 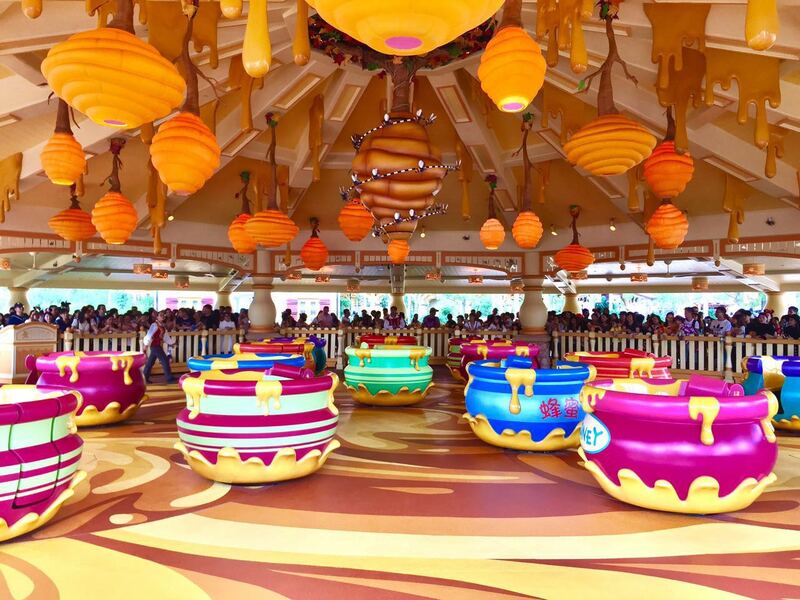 I must admit that this looks much better than the typical Alice in Wonderland themed teacup ride found in other Disneyland(s). The one major attraction that I feel is worth riding is Peter Pan's Flight. 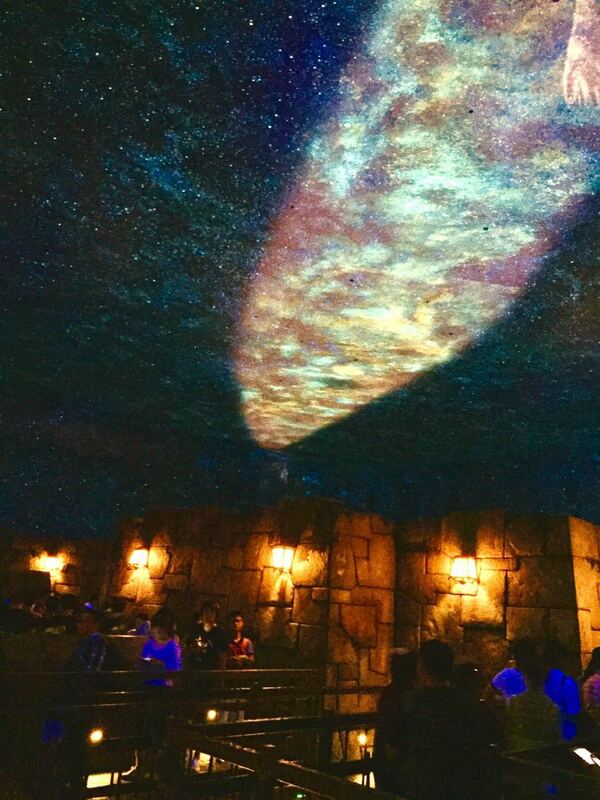 Unlike other versions in other Disney parks, Peter Pan's Flight in Shanghai Disneyland utilises more advanced projection and special effects. It's a great combination of classic and modern. 8/10. Of course, being in China means you have to create an entertainment option that suits the local culture. In case you don't know, Chinese people love karaoke. Guess what... that's exactly what Disney gives them in their park. The Frozen karaoke show is one of the most popular attractions in the park, shown in a theatre capable of holding up to 1,500 guests at a time. And yes... it's extremely popular. While it's fun and the performances of the live performers were dazzling (especially the female who plays the role of Elsa, she's such a phenomenal singer! ), Frozen: Sing-Along Celebration isn't a blockbuster show. I think in a year or two, it will be replaced by something brand new. After all, the theatre the show resides in is huge! I'm sure this can act as a venue for artist performances or something similar. Nevertheless, I'm giving the show a 7/10. It's solid, and the performers were nothing short of phenomenal for a live theme park show standard, but nothing special. Also worth noting about Shanghai Disneyland's Fantasyland is how huge the space behind the castle is. I mean... look! There's literally a huge square right behind the castle, in contrast to the other Disneyland(s). Forget about Space Mountain. In this land, TRON conquers all. In fact, this Tomorrowland is so brand new that you won't recognise it the first time you see it. Tomorrowland's entrance from Mickey Avenue. The centrepiece of this land is of course the building that houses the motorbike roller coaster that everyone is raving about. We'll get to that really shortly. 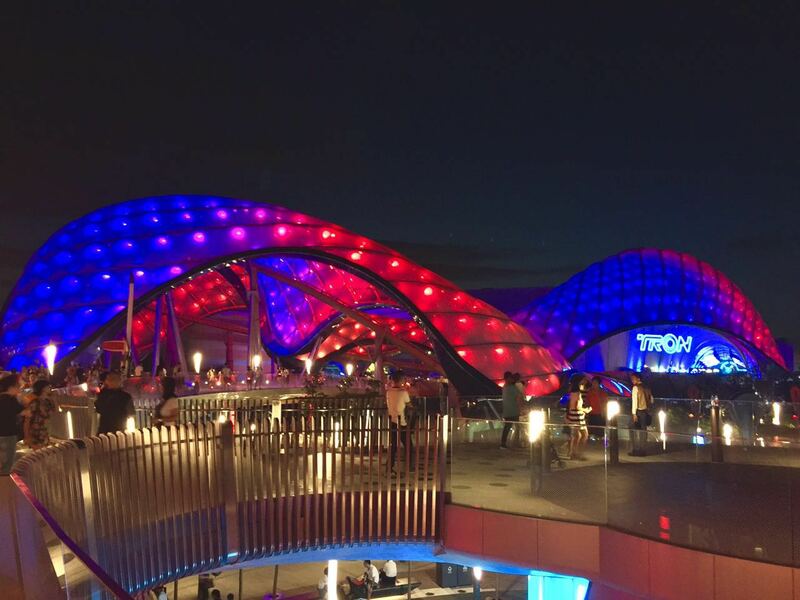 Tomorrowland by night, characterised by its multi-coloured canopies. If there's only one reason why people come to Tomorrowland, then the answer has got to be the brand-spanking-new TRON Lightcycle Power Run. This replaces Space Mountain as the signature attraction of the themed area. 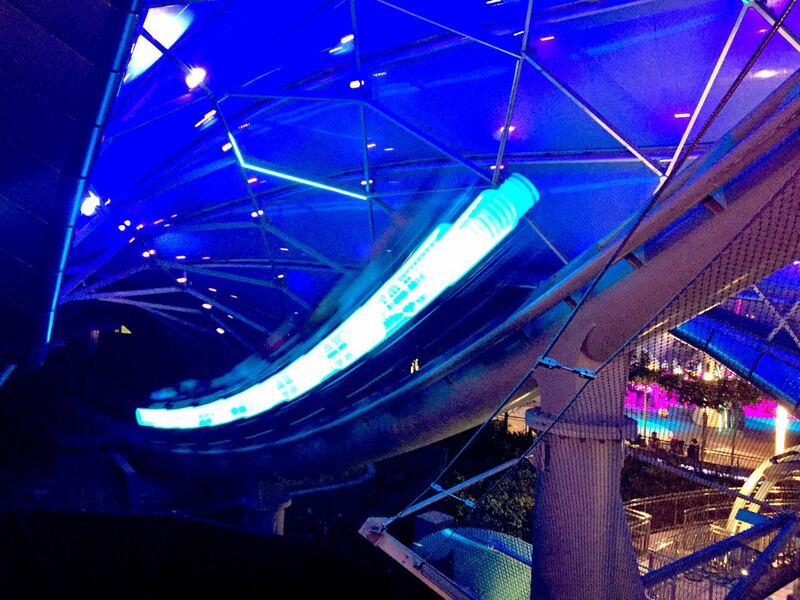 Riders cheered and screamed as they zoomed through the outdoor portion of TRON Lightcycle Power Run. TRON isn't just a roller coaster. It's a storytelling concept that Disney clearly wants to get correct and as flawless as possible. This is apparent especially from its queue, which is very immersive. There is one really cool section where guests seem to enter a holding area, only for them to then witness the most amazing interactive wall transformation I've ever seen. 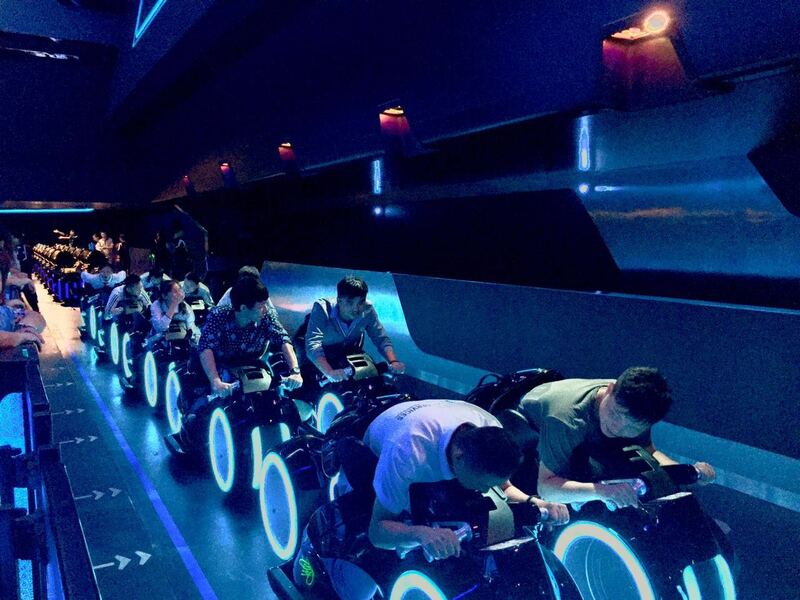 Unlike typical roller coaster, TRON requires guests to ride in a position similar to riding motorbikes. The restraints on TRON hold you in place against the back, not the lap. Guests with disability can request for specific seats - out of four trains that are usually in operation, there is one train with normal seats to accommodate them. Note that these seats are available only at the very last row of the train. 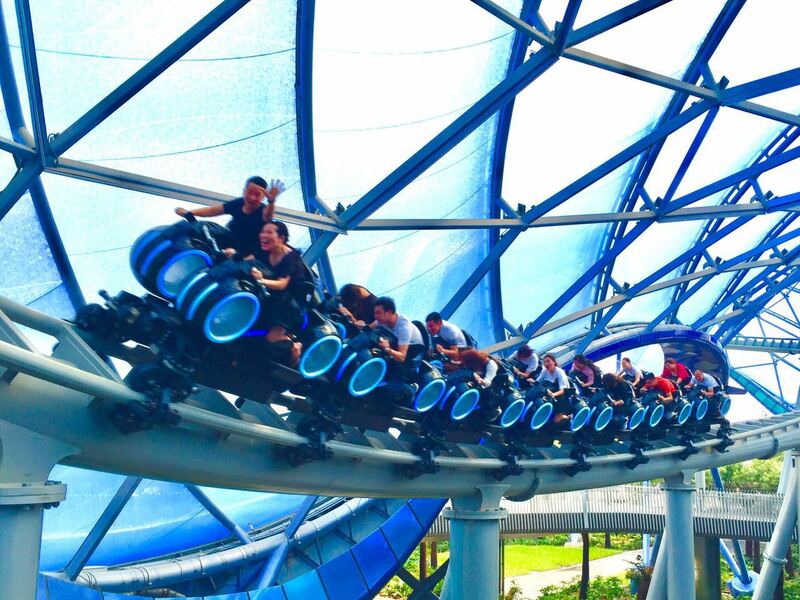 TRON's loading station with riders locked in position. The launch on TRON is not too forceful. In fact, it's one of the least forceful launches I've ever felt. Nevertheless, given the motorbike position, guests might feel more exposed than they're used to, creating that extra intensity as they're launched from 0 to close to 60 mph. Following the launch, riders curve through the outdoor portions of the coaster before going into the show building. From this point on, it's all about disorientation as riders go from one portal to another, seemingly to finish doing so before the "opposing team" manages to beat them. Waiting to be launched at TRON. 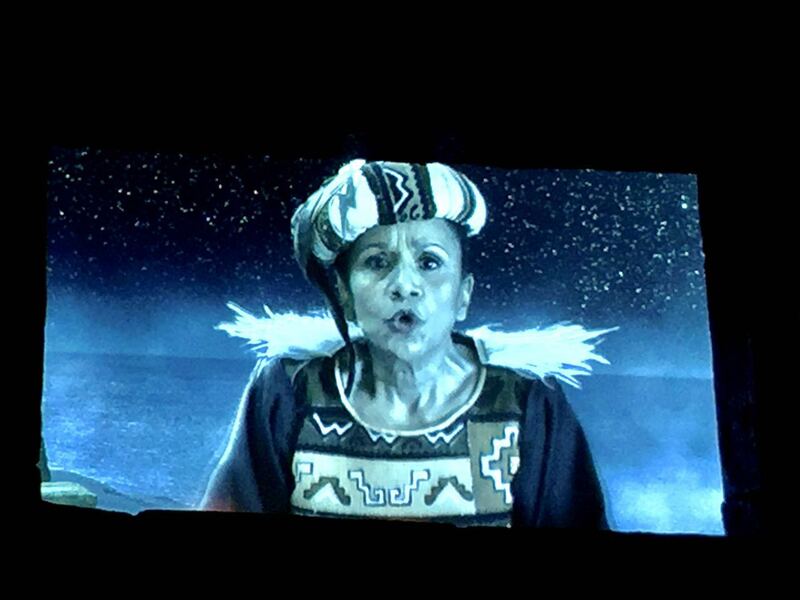 TRON's special effects are amazing, even better than those of Space Mountain. They represent the very best of "the grid," the game world in which TRON takes place. The show building was literally lit up with the amazing combination of blue and orange lights and effects. Combine that with the amazing soundtrack by Daft Punk, this is a ride that shouldn't be missed by visitors. 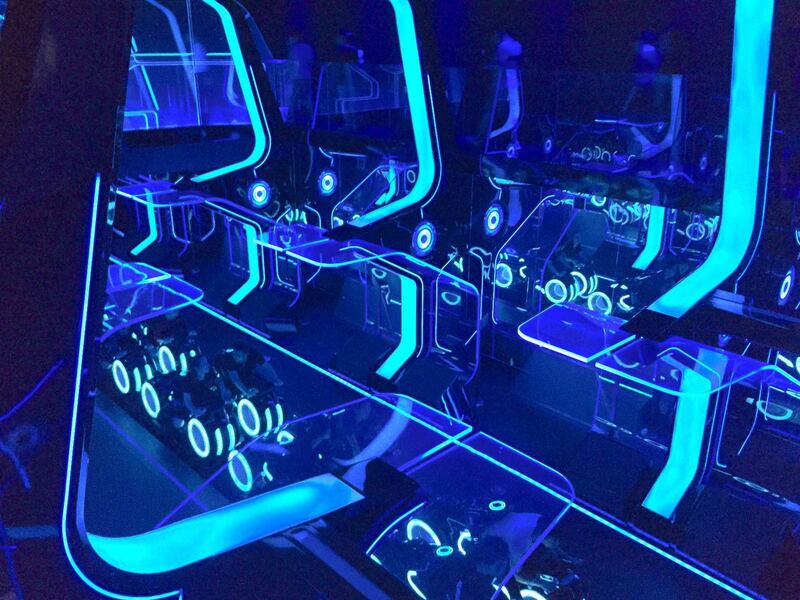 For many people, TRON is a unique experience unlike any other. But for the Chinese, however, this is probably an experience of a lifetime: roller coasters with motorbike riding position, dazzling special effects, majestic and rocking soundtrack, and last but not least immersive queue. For creating something so original and succeeding big time at it, I'm giving two thumbs up. 9.5/10. 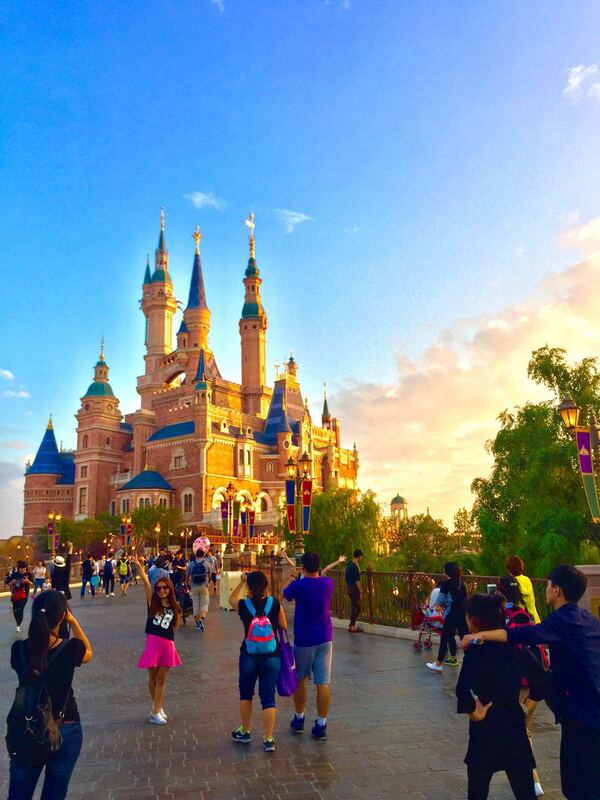 Shanghai Disneyland definitely sets the bar of Chinese theme park industry to a new high. With carefully designed park layout, proper staffing, and dazzling attractions, it shouldn't take long before words spread on how great this park is. It seems that Disney learned a lot from the mistakes they did with Hong Kong Disneyland. Back in 2005, Hong Kong Disneyland was opened with very few attractions. This time, they didn't rush. They took the time to secure all of the attractions in place. The result: a Disneyland that feels "complete," with rides here and there to experience. Shanghai Disneyland's pathways are excessively huge. Is this one of their measures of crowd control? 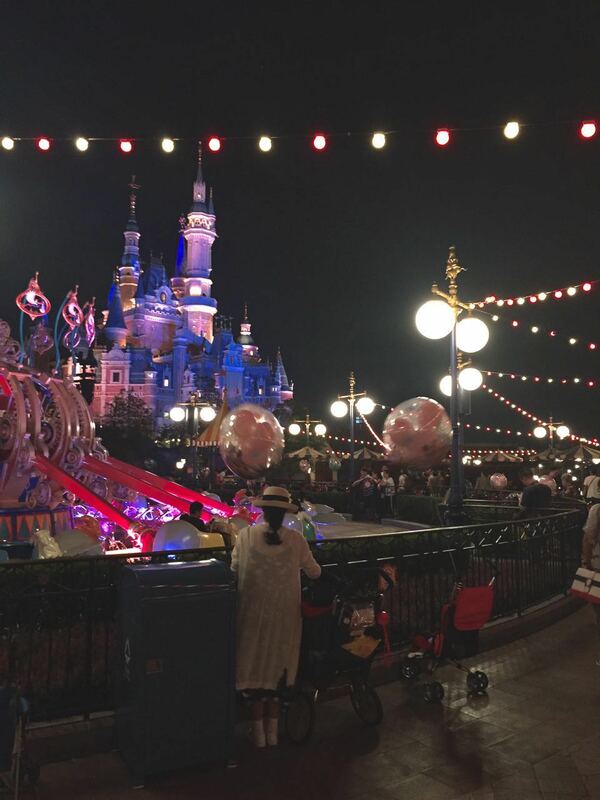 One thing that Shanghai Disneyland lacks is the "magic" and the "charm" of a Disney park. Here, the pathways are wide, and the castle oddly feels out of place. There's something "industrial" about the park that I can't simply dismiss. Nevertheless, this is done out of necessity, given the massive population of Mainland China, as well as the consideration that local visitors tend to... well... the risk of deadly stampede. Another thing that I found very odd is the picnic areas. 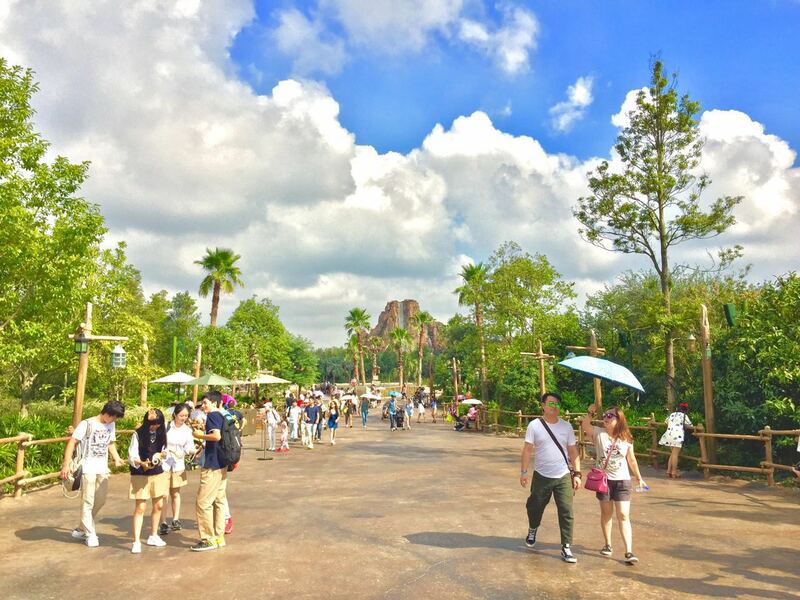 Yes, Shanghai Disneyland actually allows people to bring as much food and drink as they can from outside, and they even provide a lot of green spaces around the park for them to enjoy their food and drink. Perhaps this is a local culture stuff that I'm not aware of? 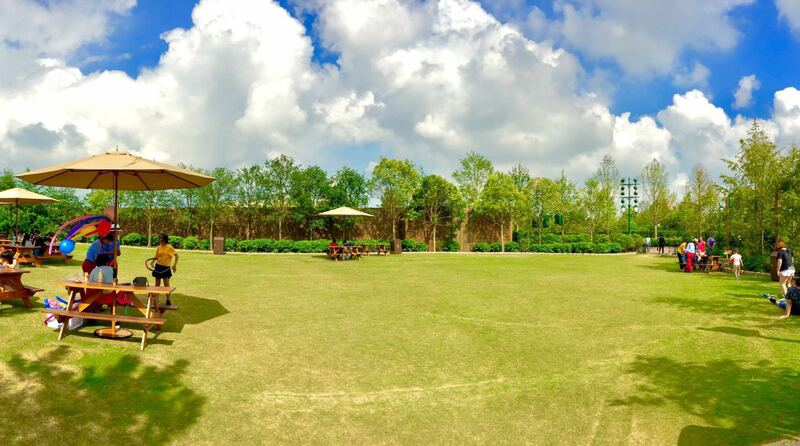 One of the many green spaces where guests can enjoy their food and drink... and roam around. One major complain that Shanghai Disneyland seems to get a lot is the pricing of the food. I didn't find the food to be so expensive that I complain about it. For example, I purchased myself a combo of fish and chips + soft drink for CNY80. That roughly translates to £9.50 or $12.00. Not too bad at all, no? Perhaps this is related more towards the local visitors. If that's the case, then I understand. Even though Shanghai is a financial hub, the income per capita in the area is much lower compared to that of, say, Los Angeles, Paris, Tokyo, and even Hong Kong. A combo of fish and chips + soft drink costs CNY80 at Shanghai Disneyland. As for the attractions, I'm also surprised that neither TRON nor Pirates of the Carribean is the most popular attractions at the park. Instead, most guests tend to crowd both Soaring Over the Horizon and Roaring Rapids. Another subject that people have discussed about is the behaviour of the local visitors. Stories such as this and this have emerged, creating negative online publicity for the park. Fortunately, I didn't encounter such behaviour during my visit. Nevertheless, local visitors tend to cut lines a lot - I meant A LOT! This happens particularly at Soaring Over the Horizon, where the queue zig-zags in a rather small area. Thankfully, the security team did a tremendous job in keeping the orderliness of the lines. I literally saw at least 10 people thrown out of the line because of this. Well done, Disney Security Team! The fireworks lighted up the night. Oh, and did I say that the fireworks were awesome? One of the best Disney has ever done! 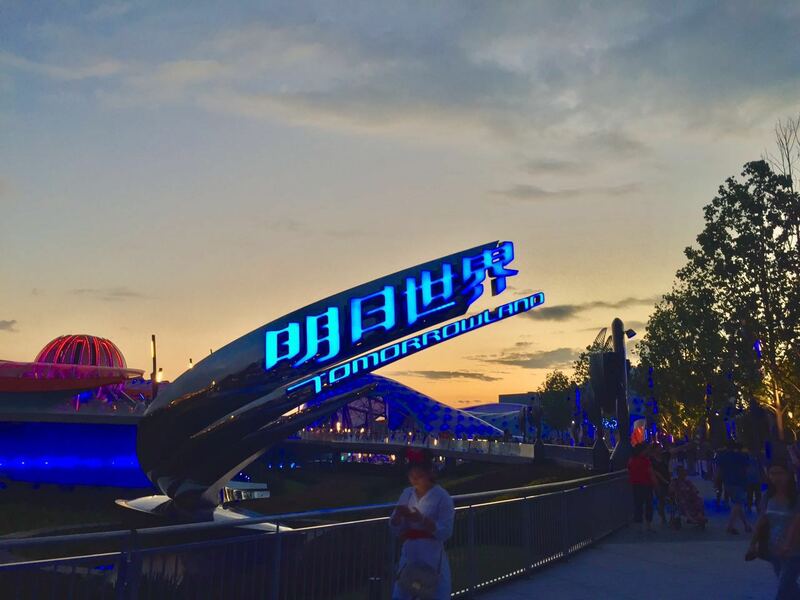 WHAT THE FUTURE HOLDS FOR SHANGHAI DISNEYLAND? The real map of the park, as taken from the official app. As seen above, the park seems to have plenty of space for future expansion, especially those empty slots between Treasure Cove and Fantasyland, as well as between Fantasyland and Tomorrowland. My first thought would be Toy Story Land for the space between Treasure Cove and Fantasyland. With the resort already having a Toy Story-themed hotel, it's a great fit to have the area in the park too. Nevertheless, I don't see them putting the Toy Story Midway Mania ride, as they already have other similar ride in the park. My second thought would be Marvel-themed Land, located in that huge space between Tomorrowland and Fantasyland (left side). Perhaps this could be another Shanghai-exclusive themed area with brand new attractions and look. Let's see what the Imagineers come up with in upcoming years! GET TO THE PARK AT LEAST 30 MINUTES BEFORE OPENING. 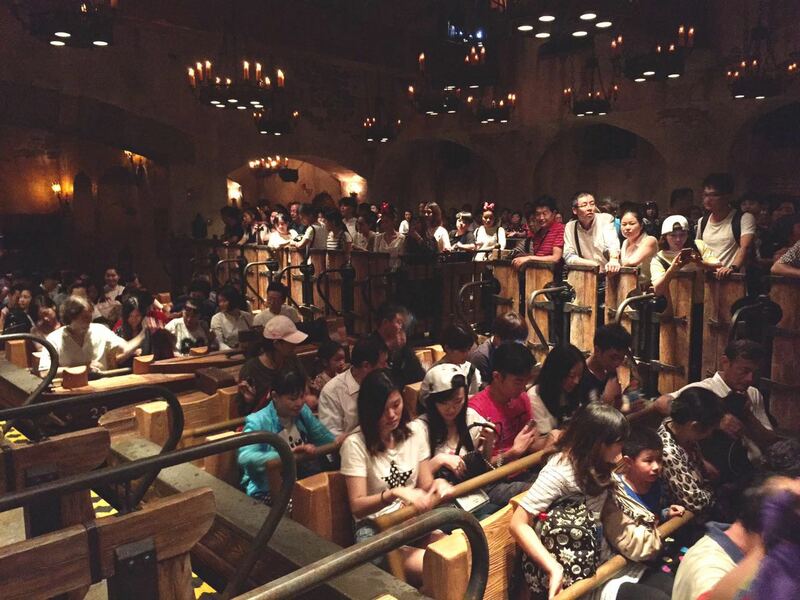 The rush hour is real at Shanghai Disneyland. Before you enter the ticketing area, visitors are required to go through security lines that are - unfortunately - manual. This would take somewhere between 30-45 minutes, depending on the crowd level. 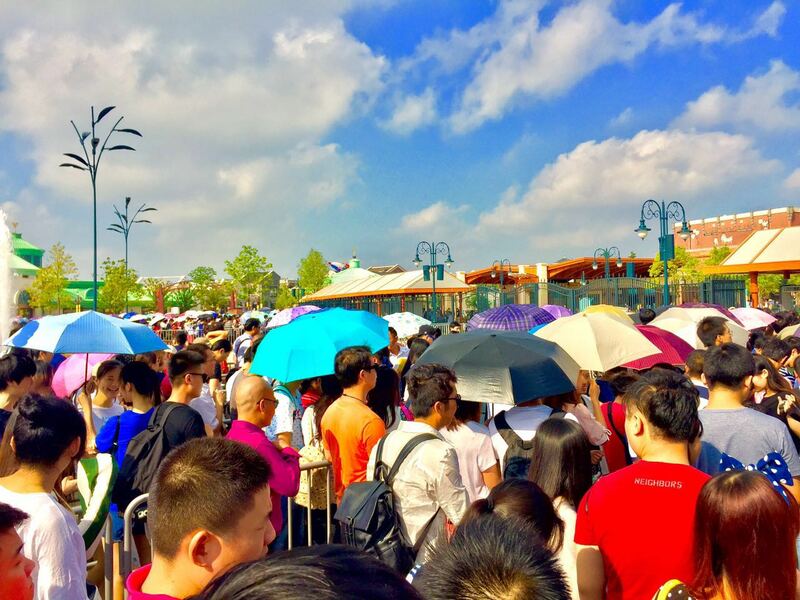 The MASSIVE security lines before entering the ticketing area of Shanghai Disneyland. GET YOUR FASTPASS TICKETS FIRST THING IN THE MORNING. 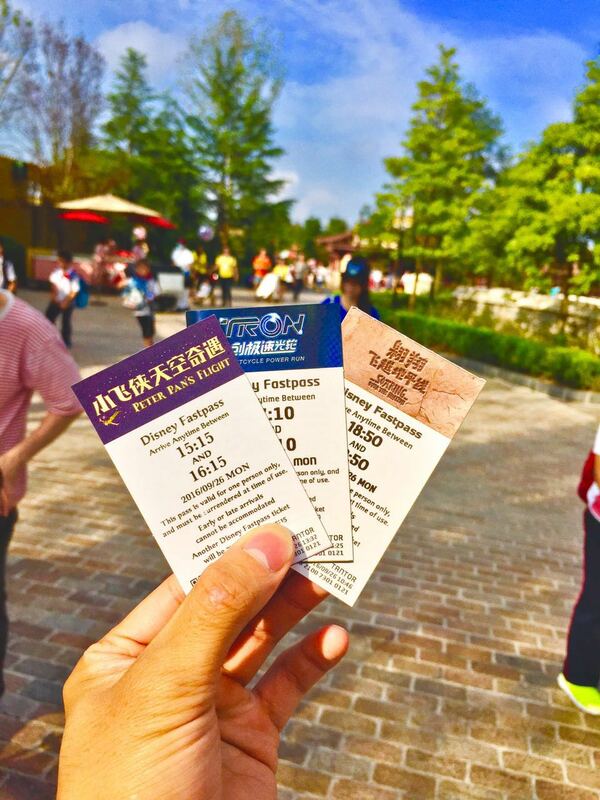 Shanghai Disneyland visitors tend to flock into the Fastpass booths instead of the attractions themselves first thing in the morning. Fastpass tickets for Soaring Over the Horizons and Roaring Rapids generally run out before afternoon, so do your best to secure them as soon as possible. During my visit, 30 minutes after the park opens, the return time for these rides are already set at 18:20. Once you enter the park, head towards Adventure Isle and get in the Fastpass booth line. Secure yourself Fastpass ticket(s) for Roaring Rapids. Once you get them, proceed to Soaring Over the Horizon. You won't regret this. Visitors flocking into the Fastpass booth at Adventure Isle 30 minutes after the park opens. BRING AN EMPTY WATER BOTTLE. Yes, you can't drink the tap water in China. Fortunately, there are plenty of filtered water fountains throughout the park, so you can refill your bottle. You'll save yourself lots of money. MANAGE YOUR TIME EFFECTIVELY. Juggling your time between getting Fastpass tickets, waiting in line, scheduling your meal time, etc. can be stressful. But if you don't mind doing that, why not? Effective time management means you can get yourself THREE Fastpass tickets at the same time. DOWNLOAD THE OFFICIAL APP. Have a smartphone? Do yourself a favour by downloading the official app. It's very convenient as it acts as a park map, a timetable for all live entertainment options, and a guide of all queue/waiting times of all attractions in the park. 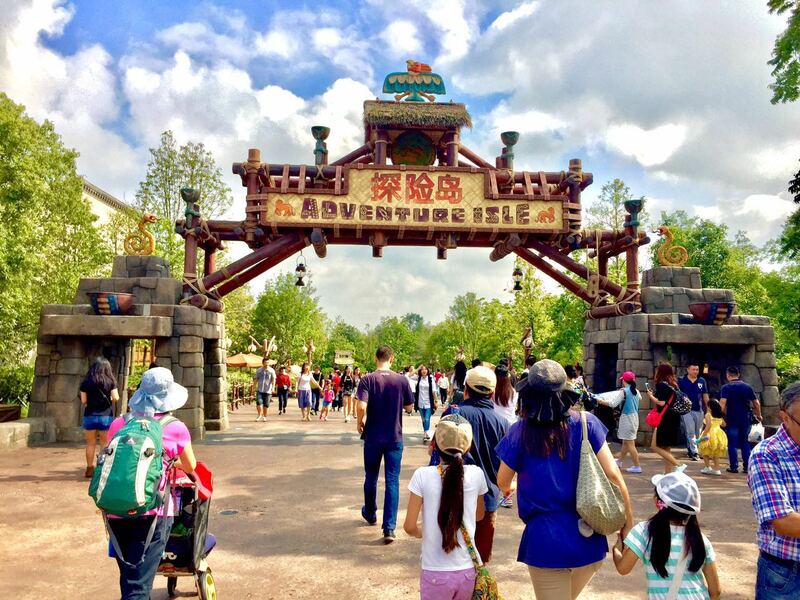 Is it worth going to Shanghai Disneyland? In one word: ABSOLUTELY! In longer words: yes, but NOT during public holidays. Other than being able to skip the massive crowd, you'll also enjoy lower admission price (CNY370 instead of CNY499). Despite the lack of "Disney charm" and "magic" that you expect from a Disney theme park, Shanghai Disneyland compensates that with fantastic line-up of attractions: diverse set of rides (from roller coasters to water rides) using the latest, state-of-the-art technology guests never saw before. But in the end, going to a theme park should all be about enjoying yourself, not rushing yourself through it. Do the same with Shanghai Disneyland. Yes, it's a massive park, but no worries: you've got all the time you need. Take the time to explore the hidden paths, say hello to the staffs (they're very nice! ), dance with Mickey and Minnie. Be your kid-self for the day. After all, innocence is the most powerful force in this world. And I think that's all from me for today. Keep living your life #OneThemeParkAtATime, folks! What camera did you use? I just used my iPhone 6 camera, with the HDR option on, then I edit the hell out of the photos, particularly with high saturation, haha! Thanks for the review! Surprised to see Tron with 10-minute waiting time. $12.00 for a combo of fish and chips? That's even expensive for us... and they sell this in China! Maybe it was more related to local purchasing power. Indeed, $12.00 for a meal in Shanghai is still considered expensive. 10 mins for Tron are you serious? You sure that's not Single Rider wait? Yes I'm sure! The Single Rider line was 5 minutes long and the regular line was 10 minutes long. We went to the park just last week and was really glad that we did so before the mad rush of the Golden Week! Agree with you that Pirates of the Caribbean is amazing, but still think that Disney has rides that are better, e.g. Indiana Jones and Tower of Terror. Great post. I'm heading to Shanghai Disneyland during the weekend of 22OCT. The tips in your article are sure to help, but I will test them and see how it goes! I hope the tips help! Note that I went on a Monday (not the weekend), so the tips might not work too effectively. But yes, get Fastpasses for either Soaring Over the Horizon or Roaring Rapids first! OK, I am back from my trip - I posted a trip report on a Disney forum but won't post a link unless you permit. I will say a couple things: 1) you were spot on with your comments on Pirates and Tron: The best Disney attractions and truly world class. 2) Your speculation on Toy Story Land is likely right, but I suspect it will be over between Tomorrowland and Fantasyland. Why? Because there are Green Army Men-themed restrooms already over there. I have pics. Indeed, you're right. They actually just announced Toy Story Land last week and it's indeed located between Tomorrowland and Fantasyland. Didn't go to the bathroom, so I didn't notice, hahaha!! Thanks, Adriel. Glad to know my suspicions were correct! Is the fastpass similiar to DisneyWorld where you can take all the tickets of your family members and then get fast passes for your entire group while they are doing another ride? Hi Mike! Yes you're correct! All you need to do is scan your tickets at the Fastpass kiosks. 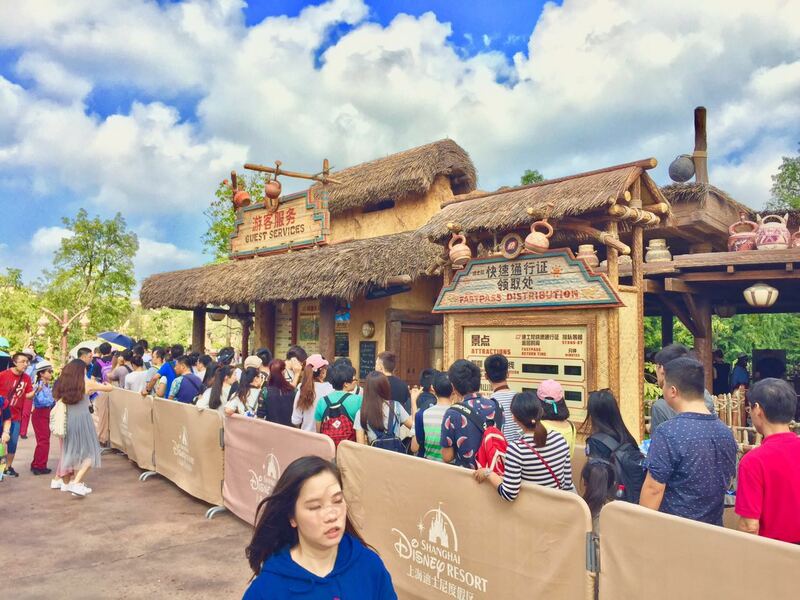 The only difference is that instead of the Fastpass kiosks located at each individual attraction, the ones at Shanghai Disneyland are placed in a particular Guest Services booth. There are 4 Fastpass booths in the park: 1 in Tomorrowland, 1 in Adventure Isle, and 2 in Fantasyland. Each booth distributes Fastpass tickets for attractions located in its corresponding themed area.